Canal boats on the Chemung Canal were limited by the size of the locks. Since the locks on the canal were 90 feet long and 15 feet wide, the boats could not exceed those dimensions. This later became a problem as other canals, such as the Erie, enlarged to accommodate larger boats. Goods being shipped through the Chemung Canal from the larger canals first had to be transshipped to smaller boats so they could fit through the canal. Canals using the larger barges could more easily compete with the railroads and the greater quantities of goods being shipped in railroad cars. The Chemung Canal was never widened, only deepened. During the time of the Civil War the canal depth was increased to six feet by simply increasing the height of its banks. Some of the different types of boats found on the Chemung Canal included scows, bullheads, and lakers. The scows were often open scows used to haul coal. Bullheads were enclosed with rounded bows. Lakers were strongly built, watertight craft that could handle the rough waters of the Great Lakes. Lakers often were used to carry grain. Boat building was an important business along the route of the canal. With plenty of timber available along the canal route, boat yards were found in Elmira, Corning, Havana, and Watkins Glen. Millport had a few boat yards. With many sawmills nearby to cut the long, thick planks, Millport boat yards turned out many canal boats. 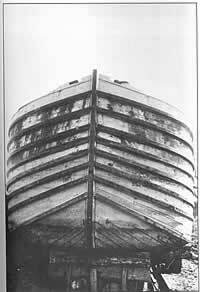 Bullhead boats had rounded ends and no room on the sides. If boatmen were not careful they could find themselves with no room for escape if they came across a low bridge. Boatmen could be knocked off the boat or even killed by striking a bridge. This is an open scow that was used to haul goods such as coal or timber. Early Chemung Canal scows were flat at either end, like big floating rectangles. Lakers had curved bows like an ocean going vessel. They were sturdy and water tight to be able to handle the rough waters of the Great Lakes. Lakers often hauled grain to market. 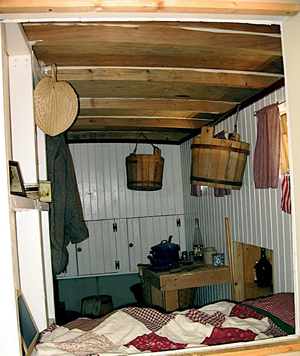 At left is a photo of the cabin of a canal boat.